Sugarcoated: Strawberry Champagne Cupcakes: A Sweet Ending to Twenty Eleven. 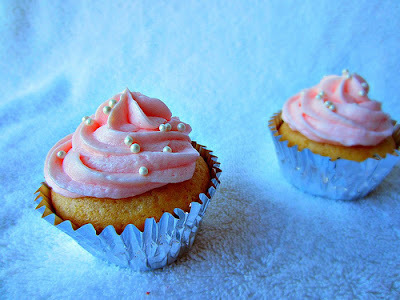 Strawberry Champagne Cupcakes: A Sweet Ending to Twenty Eleven. It's amazing how quickly a year will fly by. So many wonderful things have happened this year! My husband and I were married, a day that will exceed any other moment in my lifetime. After 3 years of being in a miserable job, I finally landed a new one that I couldn't be happier about. I made strides in my goals to become a healthier me (despite all the sugar i consumed!) Needless to say, I'm thankful for 2011 and what it brought me and taught me. I'm eager to see what 2012 has in store. I wish you and yours all the best for the upcoming year! Beat egg whites with a mixer until stiff peaks form. Fold 1/3 of the egg whites into the batter to lighten it, then fold the remaining egg whites into the batter. Fill cupcake liners about 2/3 full and bake for 20 minutes. With an electric mixer, beat together sugar and butter. Mix on low until well blended and then on medium for about 2 minutes. Add vanilla and champagne, beating on medium for another minutes. Pipe onto cooled cupcakes. 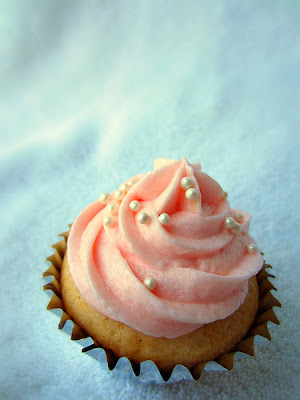 I added some hot pink food coloring gel to make the icing a light pink to match the color the actual champagne was. (took about 2 small squeezes to get it the color I wanted.) 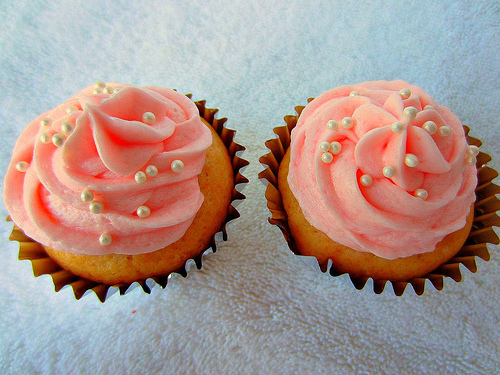 I sprinkled some white cupcake pearls to make them purrrttty. I always loveeee looking at your cupcakes!!! These look so fun!